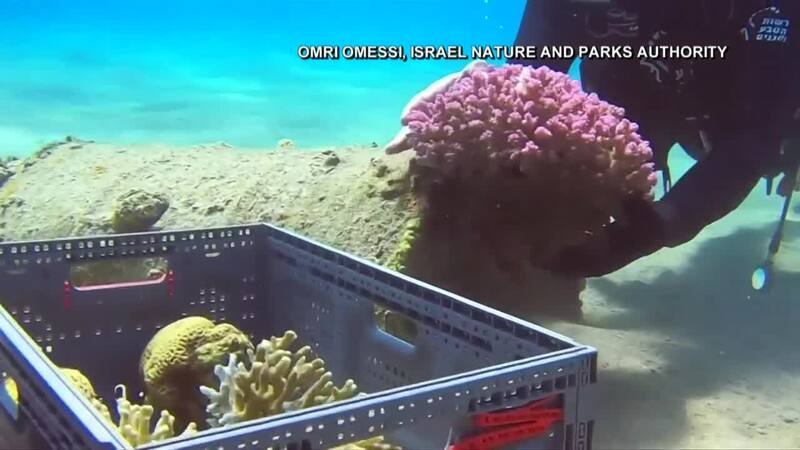 Authorities in Israel are relocating beautiful corals for their own protection while industrial debris is removed at a newly accessible virgin site. EILAT, Israel -- For 50 years an Israeli oil company kept snorkelers and scuba divers away from a prime strip of beach in a Red Sea resort area. But it couldn't stop the sea life. A spectacular and diverse reef, undisturbed by the splashes of three million beach-loving visitors each year, blossomed. The corals made the oil pipeline and a simple docking pier their home. A year and a half ago the one-thousand-foot-long beach was handed back to the public after the pipeline company, whose facilities are gated off and subject to military secrecy, scaled back its operations. Faced with huge visitor interest in the virgin site, Israel's nature and parks authority decided to relocate the corals for their own protection so the industrial debris left by the pipeline company could be removed.